Chandigarh: Toeing Shiromani Akali Dal (Badal)’s line the Shiromani Gurdwara Prabhandak Committee (SGPC)’s executive committee (EC) has announced to reject Justice Ranjit Singh Commission’s report. 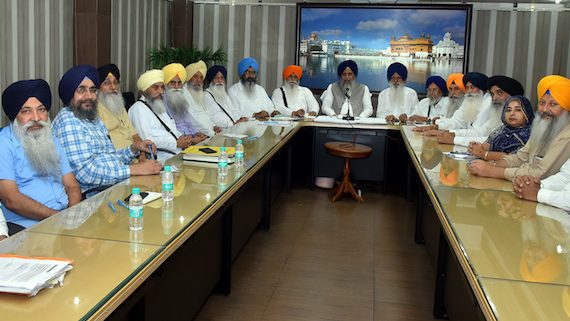 The committee that met at Amritsar today passed adopted a resolution to announce that the SGPC does not endorse Justice Ranjit Singh Commission’s finding. But one of the executive committee members Amrik Singh Shahpur, who is the only member in the SGPC EC who is not affiliated to the Shiromani Akali Dal (Badal) raised objections against the resolution and staged also staged a walkout. Questioning SGPC executive’s move to ‘reject’ Justice Ranjit Singh Commission’s report, he said that how the SGPC could pass such a resolution even before the official and full release of the report? He said that when the SGPC did not tender recognition to the commission, there was not question of rejecting it’s report. In a written statement issued after the meeting, the SGPC president Gobind Singh Longowal said that the SGPC had earlier passed a resolution (numbered 1104, dated 30 September 2017) rejecting appointment of Justice Ranjit Singh Commission. He also alleged that the commission forged witnesses to implicate SAD (Badal) leaders on various counts and reiterated an allegation that the commission worked as a tool of the Congress party. It is notable that the commission has detailed the role of senior leaders of the SAD (Badal), including former CM Parkash Singh Badal and his son Sukhbir Singh Badal, in getting Dera Sauda Sirsa chief Gurmeet Ram Rahim pardoned from SGPC appointed Jathedars, failure to arrest culprits belonging to Dera Sauda Sira who had committed beadbi of Guru Granth Sahib Ji in Burj Jawahar Singh Wala and Bargari villages and police firing at Kotkapura and Behbal Kalan in October 2015 in which two Sikhs were killed. Badals are making hyper-propaganda to put Justice Ranjit Singh Commission’s report in question. They are quoting retraction of a witness named Himmat Singh who alleged that he was pressurised by Punjab cabinet minister Sukhjinder Singh Randhawa and Justice Ranjit Singh to sign some documents. Himmat Singh’s retraction is already exposed as he announced to withdraw his statement only after his brother Giani Gurmukh Singh was reinstated as Head Granthi of the Akal Takht Sahib. Moreover, there are multiple proofs which prove that what Himmat Singh said before Justice Ranjit Singh Commission was just a repetition of his earlier statements before the media. Himmat Singh is yet to delete his facebook post dated October 3, 2017 in which he had accused Badals for pressurising ‘Jathedars’ to grant pardon to Dera Sauda Sursa chief. SGPC chief Gobind Singh Longowal faced tough time while answering media queries during a press conference held by the SGPC after holding executive committee meeting in Amritsar today. Soon after the SGPC chief announced to reject Justice Ranjit Singh panel’s report, journalists raised serious queries and questioned the timing of SGPC’s move. They also asked SGPC chief to clarify the reasons behind the move and asked him that what SGPC seeks to do by passing this resolution. They asked him to clarify that what sort of investigation SGPC want in these cases and why Justice Jora Singh’s report was not made public by the SAD (Badal) regime. SGPC president left the venue of press conference without giving any satisfactory answer to these queries. * WITH INPUTS OF NARINDER PAL SINGH from AMRITSAR.